A community vigil has been held to honor a Northern California policeman killed during a traffic stop. Friends, relatives and fellow police officers along with many residents gathered Friday night in the tiny town of Newman to remember Cpl. 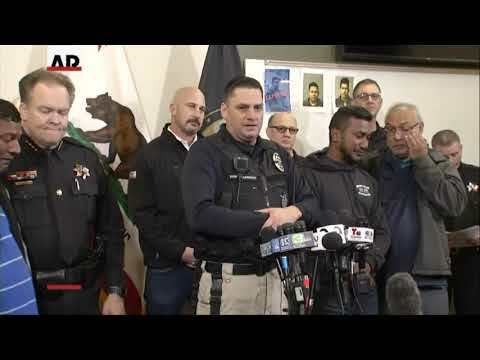 Ronil Singh on the same day that his alleged killer was captured. Officers and relatives held back tears as they described Singh, a native of Fiji, as a man who loved his adopted country, his community and his work. Singh was shot Wednesday after stopping a suspected drunken driving suspect in the town southeast of San Francisco. After a two-day manhunt, Gustavo Arriaga was arrested in connection with the killing Friday in Bakersfield. Authorities say they were told Arriaga, who was in the country illegally, was heading to his native Mexico. Authorities say a man accused of killing a California police officer surrendered without incident. Kern County Sheriff Donny Youngblood told reporters that Gustavo Perez Arriaga came out of a home in Bakersfield with his hands up after SWAT officers came to arrest him Friday. He says that besides Perez Arriaga’s brother and co-worker, three others were arrested on suspicion of helping the suspect elude authorities. Perez Arriaga is accused of killing Cpl. Ronil Singh of the tiny Newman Police Department on Wednesday after being stopped on suspicion of drunken driving. A day later and nearly 200 miles (320 kilometers) south, Youngblood says he received information that Perez Arriaga was between Modesto and Bakersfield and heading to Mexico. Surveillance teams were set up in different communities, and authorities got a search warrant for the home where Perez Arriaga was found. The sheriff leading the investigation into the shooting death of a California police officer took aim at so-called sanctuary laws that limit cooperation with U.S. immigration authorities. Stanislaus County Sheriff Adam Christianson told reporters Friday that the suspect was in the country illegally and that if he had been deported for previous DUI arrests, Cpl. Ronil Singh would still be alive. Christianson blamed California’s sanctuary law for preventing local authorities from reporting Gustavo Perez Arriaga to federal immigration officials. He spoke at the news conference about making laws stricter as the Singh’s brother wept beside him. The sheriff says Perez Arriaga was a native of Mexico and had been in the U.S. illegally for several years. He says Perez Arriaga’s brother and co-worker also have been arrested for misleading investigators.